Great info below and newer reports are on the pages that follow. Anyone been out hitting the wally's hard on Cass Lake? if so has there been a time frame where theres more action during the day? and has anyone found a certain depth that there hanging around in? and hows the night bite ? I've been swamped at work and haven't been out for a while Wish I could help! well ill be on cass lake friday,saturday,sunday. maybe you need the day off and well go catch um !!! I work a half day tomorrow, then I'm off til Monday! Time for some fishin'! snowmobiles are working fine, best is to have a plow on a pickup truck or 4 wheeler but the snow is gonna keep on coming. how much ice is out on cass ? I haven't been out on Cass for a while, but there was at least 20" on Pike Bay today. Not much action til about 4:45, then the bite turned on all of a sudden. In about 15 minutes got 4 walleyes and some nice perch. When I was packing up the QF3, a hefty 'pout smacked my buckshot...that was a fun fight to end the day on! Don't mean to stray from the subject but thought I'd share what we'd seen with ya. Back on the 9th we where up there and staying just south of Stoney Point and seen a good sized wolf crossing the lake. It was between us & the point, about 150 yards away. it had stopped several times and looked our way then continued across to Star Island. Just happen to catch it at the right time. Definately was pretty neat to see! That would have been cool to see! Years ago in the summer I was going from Sailstar out to Star Island to do some landscaping work, and my boat passed by a whitetail deer about halfway there! hows the fishing been. I was going to try and get up there again before the end of febuary, but i dont think i will have the time to get away! 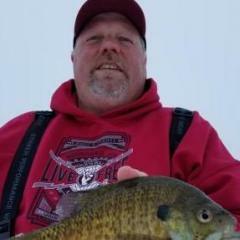 I hear there hasnt been much fishing going on do to all the snow and the layer of frozen slush ect.? anybody been out with any luck on cass, kitchi or pimushe? heading up the way in 2 weeks to try it again. Tough off road travel is the name of the game. Set up in 12ft. of water last weekend and did ok. It would be good to go chase perch but need a plow. ya im guessing there is a ton of snow up there right now. I am coming up to Cass Lake Lodge Feb 13. Any advice? Sounds like the fishing is ok if you can get around. I have only fished Cass once and it was in the summer. They should do a good job of setting you up on fish. We where up there shortly after the 1st of the year and had a blast! If you're ambitious pluck a number of holes around stoney point there until you find them,(you may still be set up near it?). We had success off a ridge in 18' to 20' during late morn and early afternoon. Found perch at many many holes. A successful trick we'd applied is when all those perch go to attack the jig we'd quickly lift higher and try to keep it away from them. When an eye would hit the flasher you'd know. And it wasn't uncommon for them to come up 3-4 feet. That was the 1st of the year, that can all change. Navigation was impossible for us in our trucks but we got around just fine on sleds. Good Luck & if you get a chance shoot a report. Thanks for the info. I am not sure we'll have the room to bring out own augers or anything but if the weather is nice maybe Cass Lake Lodge will drill us some holes for exploring during the day. I will try to post a report when we get back. Last year I started to fish for walleyes in the evening on cass. It seem that alot of the fish were to small to keep.The majority of them were 10 to 13 inches and when I caught anything longer, they were on the skinny side. The numbers were there just not the quality. Did anybody else notice this? There is definitely a strong years class of those fish in Cass. Last time I fished it was this fall and we caught plenty of eater and bigger walleyes as well as the little guys. we had pretty much the same result in June when we fished. All fish were pump and healthy. What time of year was it that you were catching the skinnier fish? It was in August & July in the main lake. Maybe I should try fishing in the fall. How big were the eyes you were catching? Like Borch said. There are many different year classes of fish and you will notice when those year classes are larger. During the middle of the summer months it will definitely be hard to catch the larger walleyes just do the time of the year. Fall is my favorite time to catch big eyes and yes you should give it a try. If I recall correctly the biggest was 28" with many in the low to mid twenty inch range. A person has a lot of the lake to themselves in the fall. Plenty of bonus muskies as well a jumbo perch and crappies. Bonus muskies, thats my thing. Is this the main lake your fishing where you catch muskies by acccident? I ask this because I tried to find the muskies on the main lake and not a thing. I can find them anywhere else on the lake just not in the main lake. It could be because of the time of year I fish too maybe(June,July,&Aug).Thanks for the replies. So the weeks betwixt point and click and smoke pole deer hunting always have my ire up to get that last Musky Missile into my hands. Gotta scrub that slime into my glove until next year. Going to give the Mississippi below Falls a try here in a few hours. Might find it frozen, might find a spot to get in. I'll bring my boat because I'm an optimist, but I'll bet the kayak is where i end up. Wish me luck, otherwise I have a scheme on my mind for my favorite frozen central mn musky lake.